Handy little full colour Collins map of central London with a high level of detail. Clear mapping of central London from Regent's Park in the north to Kennington in the south, and Kensington Gardens in the west to Tower Bridge in the east at a scale of 1:12,500 (5 inches to 1 mile). Maps of West End shopping and theatres are also included. 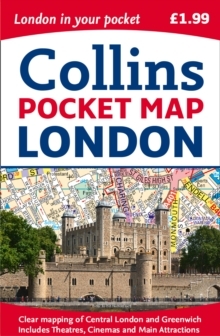 Clear, detailed, full colour Collins mapping is presented in a handy format ideal for the pocket or handbag. It is excellent value and covers the most visited area of central London.